Check out the new line from the makers of Xploderz, BlasterPro! BlasterPro uses the same ammo soaking system as Xploderz, and also uses a clip/mag loading system. The only difference that the BlasterPro guns now have triggers! A feature that was very missed and lacking from the Xploderz line. The Pump Action S2500 retails for $29.99, and the Auto Fire E5000 retails for $49.99. The ranges constantly get up to 75-80 feet, and each blaster comes with a zombie target, a couple of thousand rounds of ammo, and instructions. Check out their site for more info, and get familiar. They sent me the Pump Action S2500, so I’ll have a review on that in a day or two. Hey everyone, Jason here. I’m going to be a little bit busier these two upcoming weeks, due to summer school and preparing for my Camarillo Humans vs. Zombies game on July 20th. In the meantime, could you just take this small poll for me? Helping me pick what content to post should help everyone that views my blog. You can select multiple answers if you want to. Thanks for your time! 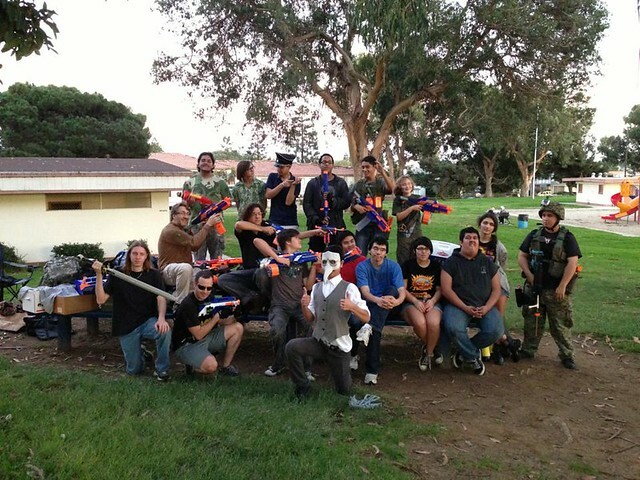 In preparation for the Camarillo Southern California Humans vs. Zombies event, I’ve compiled a kick start checklist of things that I should do or improve to prepare myself for this event. If my calculations are correct, I have 78 days left until the event, which takes place on July 20. Get a little bit more comfortable with my blaster of choice for this game, the Rayven. Work on Cardo, at least 3 times a week, for 25-30 minutes each. Start collecting and counting bad socks. Learn how to roll them up, if there is a proper technique. Finishing reading the Art of War. Get Spectre barrel from other storage site. Invite, and in some cases convince, friends to go. Modify or improve Nerf Tac Vest and/or drop pouch loadout. Sort good darts from bad darts. W & T Streamlines for the win, remember? Possibly get different containers for good and bad darts? Check which 18 dart drum clips rotate well, and which ones don’t. Get a feel or find a way to track 18 dart clip usage. (Most likely) buy GoPro Hero 2 camera and SD card to record footage of game. Buy stronger voltage batteries, battery converter, case, charger, and multimeter from Chinese store (note to self, allow 3 to 4 weeks for shipping). Thats about 15 or 16 things I need to do, some or continuous, others are one and done. Something tells me I won’t get them all done, but stay tuned and I keep you guys updated with blog posts. The first page of the lawyer letter they sent to Pocket. Popular Australian Nerf blog (and fellow affiliate) Urban Taggers is back for an update over the past month. If you wanna know what happened with him, check his blog here. Nerf Blaster Challenge Apple App out Now! Join the NERF Blaster Challenge and put your shooting skills to the test! Show off your Blaster speed and precision as you unlock new levels and earn stars! Scan NERF packages to gain access to NERF Blasters like the N-STRIKE RAYVEN CS-18 and the VORTEX LUMITRON as you complete the VORTEX and N-STRIKE Challenges! On iPhone & iPod Touch. Nerf’s app is finally out! I haven’t had a chance to try it, since I’m an Android user myself, but for those who have an Apple product, you can check it out here.